I received this sample of Tea Ave’s Oriental Beauty for free, a review of the tea was not requested by the company. I am a sucker for detailed packaging and Tea Ave does not disappoint. 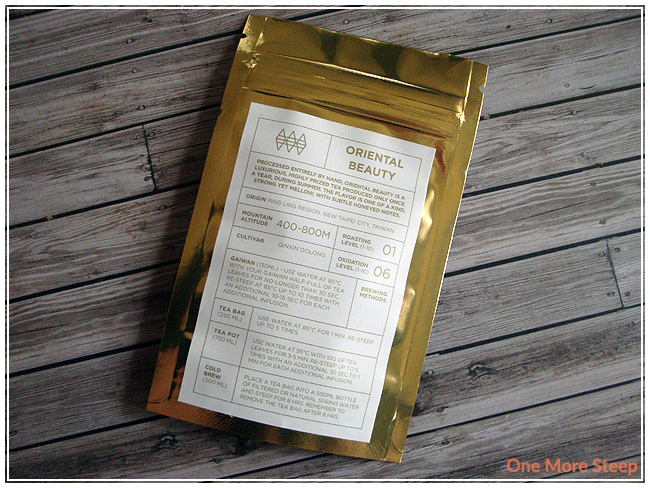 The label for Oriental Beauty gives some details about where the tea comes from, the roasting level, oxidation level, and then the brewing methods (of which there are many). The brewing methods include use of a gaiwan, tea bag, tea pot, and cold brew. Wow. This little sample bag had enough for me to do two cups on separate days. The tea leaves are lovely with light twists in the leaves. The dry tea has this great sweet floral and fruity aroma to it that isn’t overwhelming. The floral scent is quite light and it smells quite nice. Oriental Beauty consists of qing xing oolong. For the tea bag method, Tea Ave recommends steeping in water at 85°C (185°F) for 1 minute and that the tea can be resteeped up to 5 times. Oriental Beauty steeps to a beautiful clear golden yellow. The aroma from the tea is very much like the dry leaf – a light sweet, floral and fruity scent. 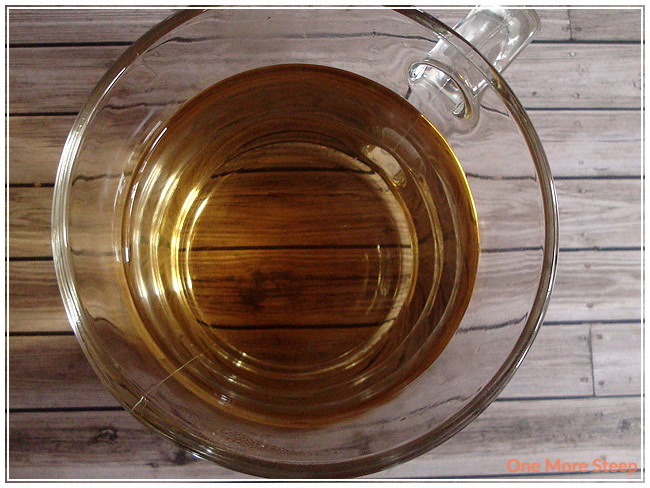 The tea itself is smooth, with a mild natural sweetness that doesn’t overwhelm the taste of the tea itself. The sweetness to the steeped tea reminds me a lot of honey, but it doesn’t overpower the natural floral and fruity taste to the tea. The fruity part of the taste reminds me a lot of berries. It’s a very pleasant cup of tea with absolutely no bitterness or astringency at all. Although the directions said to resteep up to five times, I actually resteeped an additional seven times. The mild sweetness to the tea actually gets bolder for resteeps 1 to 3. The flavour of the Oriental Beauty remains true to the first cup for resteeps 1-5. The 6th cup was beginning to taste thin in comparison to the cups before it, and the 7th cup was basically a watery ghost of what the oolong did taste like. I loved Tea Ave’s Oriental Beauty. This is a fantastic oolong as it resteeps very well. 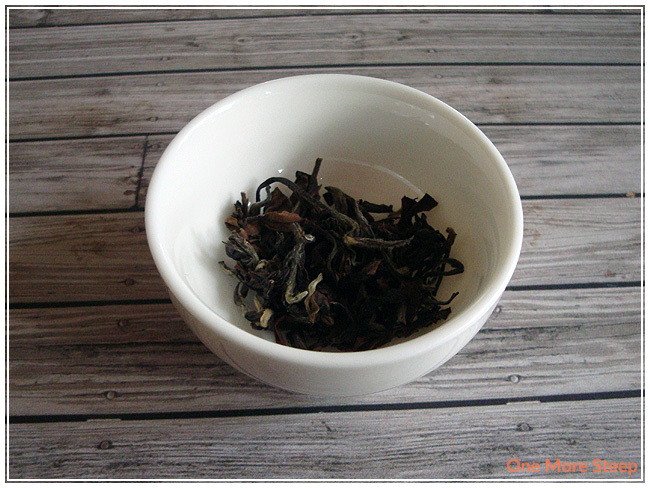 While it is one of the more expensive teas that I’ve reviewed so far on One More Steep. I think the fact that it does taste fantastic and can be resteeped many times makes up for the initial sticker shock. I definitely think that this is the type of tea that you should have when you’re not going anywhere though, as you wouldn’t want to leave wet tea leaves laying around to be reused the next day. If you’re going to resteep (and resteep again! ), it should really be done all in the same day since it can be difficult to properly dry the tea leaves out (and mold is a horrible thing to ingest). For the value of a great tasting tea that can be resteeped up to 5 or 6 times, I think that Oriental Beauty is a wonderful oolong that deserves a taste if you’re looking for a tea to treat yourself with.